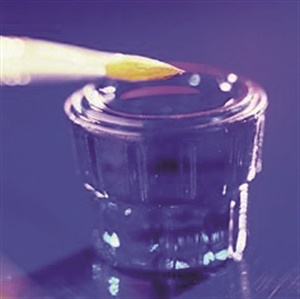 1997 was a pivotal year in the nail industry’s fight against the use of MMA (methyl methacrylate) in acrylic monomer. The FDA had deemed MMA unsafe in the mid-1970s because of the health risk posed to nail techs and because it required techs to aggressively rough up the nail before application. Once adhered to the nail plate, the rigid enhancements were extremely difficult to remove, leading to serious damage if a nail was jammed or caught on something. Nonetheless MMA monomer continued to be used by many salons. A tipping point came in 1997 when nail techs and industry groups began advocating vocally against its use, resulting in MMA being banned by many states. Nail techs banded together to educate the public on its dangers, some offering to remove MMA nail coatings free of charge. They also enlisted the aid of the media when possible to get their message out. Notably, nail tech Diana Bonn testified before an Indiana State Senate committee, leading to a ban in that state.